This post reviews progress against my 70:20:10 Certification pathway. Coca-Cola Amatil Supply Chain is developing knowledge sharing using Communities of Practice (COP). It’s six months since our first COP was formally launched, in Maintenance and Engineering, and shortly after this for our Systems Super Users and Key Users. As we are starting to develop our 2016 business plans and budgets this is a good time to consider progress, benefits and next steps. We set up a single Maintenance and Engineering COP and invited all maintenance and engineering team members in Australia and New Zealand to participate – around 200 people. In the Systems area we launched three COPs – one for each operational system in scope, approximately 50 people in total. In both instances we launched these communities using a five week guided social learning program (Work, Connect and Learn – WCL) to develop skills and behaviours to participate in the COP. We ran WCL initially for the entire Maintenance and Engineering community, and then separately for the Systems communities. I shall post separately on evaluation of the WCL program. 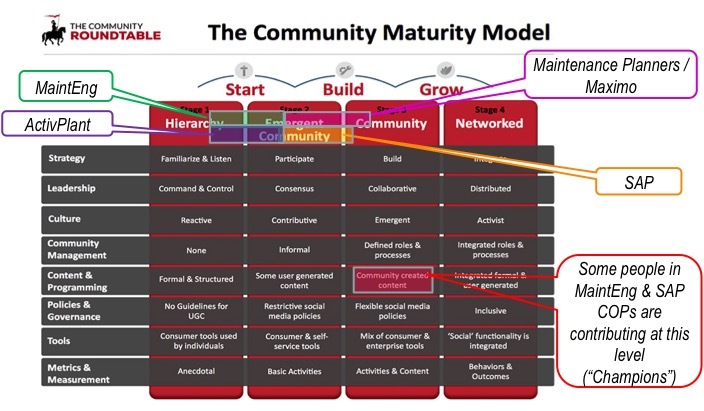 The current maturity of these COPs is shown below on the Community Maturity Model from the Community Roundtable. The three crucial COP characteristics (as defined by Wenger-Trayner ) of domain, community and practice were used to identify factors impacting COP maturity – as shown in the table below. Most importantly, it is clear that value created by COPs can take considerable time to materialise. The key insight is that to generate tangible performance improvements you need to put effort and resource into community management. Accordingly, a key review recommendation is the appointment of a dedicated Community Manager. Create community strategies and road maps to build existing COPs. This entry was posted on August 29, 2015, 4:03 pm and is filed under 702010, Community. You can follow any responses to this entry through RSS 2.0. You can leave a response, or trackback from your own site. Hi Michelle. I’d be interested to know if the value-creation framework played any role in formulating your reflections at this stage. In our latest version of the framework we focus on learning loops, did any of the data you collected for any of the cycles inform what you did to generate value in any of the other cycles? And thanks so much for working out loud here. Very much appreciate it.